Buttieri Press offers a variety of purchasing options. See below. Direct from Buttieri Press. Place your order by mailing a check or money order for $23.75 ($20 for the book and $3.75 for shipping) direct to Buttieri Press, 15 Riverside Avenue, Gloucester, MA, USA. Online, add to cart below, then checkout at bottom of page. A commemorative book to celebrate the 90th anniversary of St. Peter’s Fiesta in Gloucester, MA, this story is about a young boy named Joey who wonders why the Fiesta is so important to his family and the people in Gloucester. He participates in the Fiesta with two of his cousins — Jacob and Amelia — and his Nonna (Nonna is the Italian word for grandmother). Throughout the celebration the children meet people who explain the various traditions and the meanings behind them. The book is written for children ages 5-9 and is superbly illustrated by Maura O’Connor. The final pages of the book include a brief history of the Fiesta for the adult audience with photos from the early Fiesta years and photos from the 90th celebration. 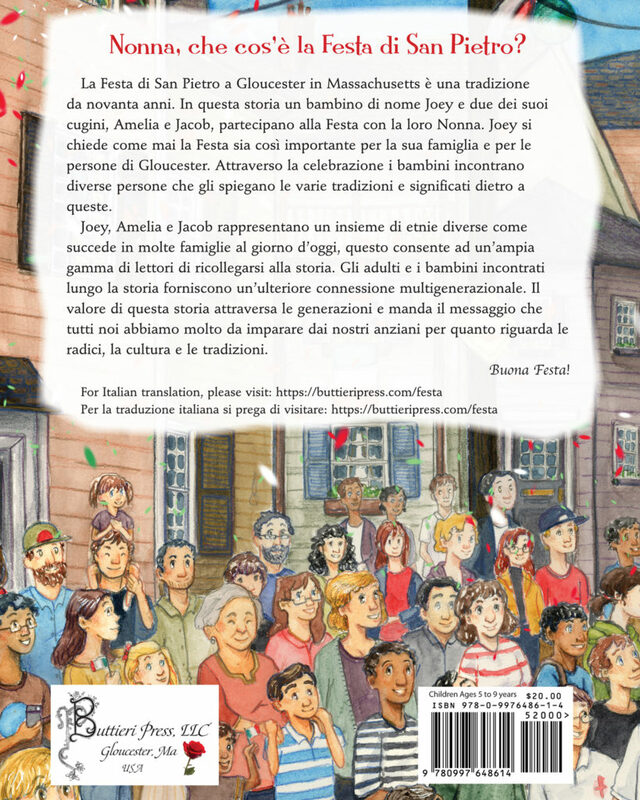 The book is dual language, translated into standard Italian by Diletta Ballati, available to view here: Nonna, che cos’è la Festa di San Pietro?